Thanks to the introduction of biometric earbuds, we now have wearable tech coming out of our ears and if it means we don't have to strap health monitors to our chest, wrists, or ankles every time we go for a run, that's a good thing. In fact, Intel's inbuilt optical sensor is so subtle, you wouldn't guess these lightweight, waterproof headphones really can measure your heart rate as you exercise. But they can and they do so without the need of a battery by drawing power from your smartphone, which also displays your HR data via the RunKeeper app. We've seen biometric earbuds before in the Jabra Pulse Wireless, but 50 Cent's brand, SMS Audio, is pitching the BioSport at the same price as the sporty Beats by Dre Powerbeats in-ear, which lacks a health monitor. So it looks like 50 has one over on Dre this time. With no battery and a heart-monitoring circuit so small you can't see it, the SMS Audio BioSport In-ears are no bigger than regular earbuds like the Bose SIE2i Sport or Sennheiser Momentum In-ear. They weigh less than 160g and with plenty of bend in the rubber ear gels that grip your antihelix (inner ridge of your ear) they're really very comfortable. As ears come in all shapes and sizes, there are three gels in the accompanying pouch and I found a mold that seemed to stay in my ear for a whole jog, which is unusual for me. Grey, green, and blue variations are available. The cord is quite short at one meter so it doesn't get in the way during exercise and the in-line control has just two buttons. One acts as pause/play, or track skip if you press it twice, or a long press will call up either Siri, or Google Now, depending on your smartphone preference. By the way, BioSport earbuds currently only work with certain Android handsets (most Samsungs, but not much else), so check compatibility before you buy. iPhones are all fine. The other button -- or slider to be accurate – activates either the microphone or the heart rate monitor. No, you can't have both, which does mean your stats are messed up if you take a call during a workout and slide back to the mic position. When you download the accompanying app (the only one currently compatible is RunKeeper) you will be able to see your heart rate and see the data plotted on a graph during your workout. What's missing is an inline volume control, which is a real inconvenience. The heart rate monitor appears to be pretty accurate, in that it showed similar numbers to those on the treadmill in my gym. It also drew some pretty informative-looking graphs on my phone, which would no doubt be of interest to a real athlete. And the sound quality? In a word, underwhelming. They certainly don't have the slightly overbearing bass punch of Dre's PowerBeats, but neither do they reach the deep extension of the Bose SIE2i Sport. The fine treble nuances of high resolution music files are out of reach too, whereas similarly priced Sony earbuds seem to manage. 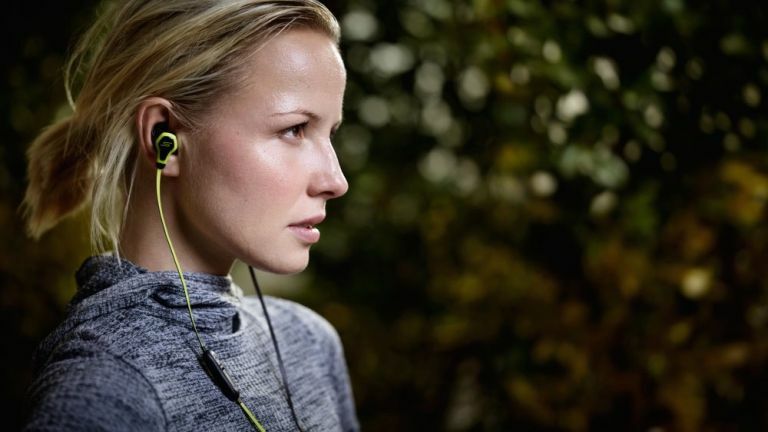 However, there is enough dynamic range and sonic detail to keep us engaged on a long run. It's just clear that some of the cover price here is paying for the Intel technology. If you're looking for a pair of sporty headphones and haven't yet explored the world of fitness trackers, the SMS Audio BioSport In-Ears put a big satisfying tick in both boxes. But don't expect them to out perform regular headphones at the same price.